The Modulatricidae is currently composed of three rather drab 'thrush-like' birds from east and central Africa. Two species — the Spot-throat and Dapple-throat of eastern Tanzania — were Initially discovered through molecular research to be unrelated to thrushes or babblers, and instead appeared to be most closely related to the Sugarbirds of southern Africa [Promeropidae; Beresford et a. 2005]. Additional research added Gray-chested Babbler [aka Gray-chested Kakamega] to the clade [Johansson et al. 2008]. Spot-throat Modulatrix stictigula of montane forests in the eastern arc mountains in north Malawi, north Mozambique, and eastern Tanzania. At various times in the past, Spot-throat was thought to be a thrush or a bulbul, Dapple-throat had been placed with chats or bulbuls, and Gray-chested Babbler had been considered a thrush. Whether the "Dapple-throats" should be placed in the Sugarbird family or in their own family has been a difficult question. All the primary research is now several years old and there has been no significant follow-up yet. It is not clearly known when this "Dapple-throat" group split from the Sugarbirds. Beresford et al. (2005) estimated the split at between 28 and 39 million years ago [mean 28 mya], but that estimate is a dozen years out of date and needs recalibration. We also could use a clearly understanding of the species in this group. Are there more species to be included? Nonetheless, none of the Dapple-throats remotely resemble Sugarbirds, and splitting them as an ancient family does make sense. Comparatively little is known about these three species. Gray-chested Babbler (Kakamega) is resident in shady montane forests, usually near streams, where it lives on or near the ground singly or in pairs. It often follows swarms of army ants (Dorylus). Spot-throat and Dapple-throat are also ground-dwellers, probing leaf litter or flicking leaves with the bill. Spot-throat is said to hop or run along the forest floor with tail held slightly elevated. Both apparently feed on invertebrates and berries (Collar & Robson 2007). 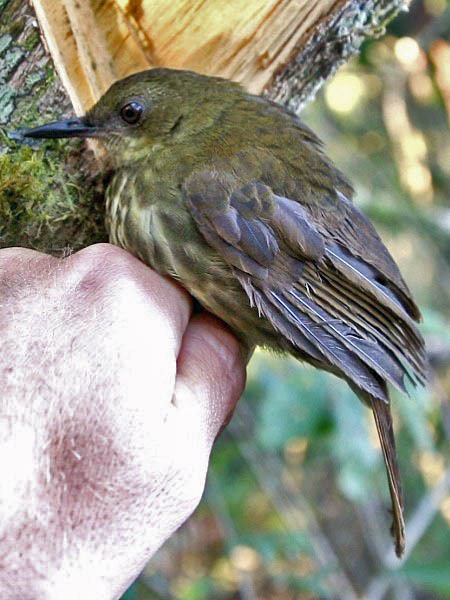 Photos: The in-hand photo of Dapple-throat Arcanator orostruthus is from Udzungwa Mountains NP, Tanzania, on 2 July 2007; via Wikipedia Commons it is credited to L. Hansen of USFWS, and is in the public domain. Bibliographic note: There is no "family book" for this new family; some basics about the 3 species in this family are in Collar & Robson (2007). Beresford, P., F.K. Barker, P.G. Ryan, and T.M. Crowe. 2005. African endemics span the tree of songbirds (Passeri): Molecular systematics of several evolutionary `enigmas'. Proc. Royal Soc. B 272: 849–858. Collar, N.J., and C. Robson. 2007. Family Timaliidae (Babblers), pp. 70–321 in Handbook of the Birds of the World (del Hoyo, J., A. Elliott & D.A. Christie, eds). Vol. 12. Lynx Edicions, Barcelona, Spain. Johansson, U.S., J. Fjeldså, and C.K. Bowie. 2008. Phylogenetic relationships within Passerida (Aves: Passeriformes): A review and a new molecular phylogeny based on three nuclear intron markers. Mol. Phylog. Evol. 48: 858–876. Winkler, D.W., S.W. Billerman, and I.J. Lovette. 2015. Birds Families of the World: A Guide to the Spectacular Diversity of Birds. Lynx Edicions, Barcelona.